Not before time, the House of Lords in the UK has announced an inquiry into European Union support for universities and student mobility. By now, the vision of a single higher-education space across Europe was supposed to be a reality. But achieving that goal is taking longer than expected. The idea was that by 2010 students and academic staff would be moving freely between European countries and institutions, secure in the knowledge that the qualifications they achieved would translate between EU member states. Some significant progress has been made in the 12 years since all this was first envisaged in the Bologna protocol, drawn up by 29 countries across Europe, and in the five years since recognition of common European degree standards was agreed in Lisbon. More than 210,000 students now spend part of their degree abroad through the Erasmus exchange scheme alone, and the number of academics crossing national borders to teach is increasing year on year. But no-one would argue that we are anywhere near reaching all the goals these two agreements set out. A report last month on the Erasmus scheme showed that one in five students was forced to retake courses and exams after failing to receive full credit for studies abroad, while the European Commission has just put forward new measures to support the aims of the higher education area, including profiling institutions and giving financial support to master’s students studying abroad. Professor Paul is right to be critical of the slow pace of change. He suggests closer collaboration between a small group of universities with international outlooks from different member states as a pilot project to acheive a more meaningful model for a European education. This would then be the ‘blueprint’ for the new European University. I’m not sure that we need a new blueprint – there are many excellent internationally-focused universities across Europe and I think it is unlikely that many of them will wish to change their approach because of such work. Greater convergence will happen where it is in the interests of universities to do so. Some change has happened, albeit slowly, towards the Bologna and Lisbon agreements but what all of this does highlight is the difficulty of imposing external standards or structures on autonomous universities where the benefits are not immediately obvious. It is far from clear that a standardised European view of international education is what is needed to deliver a “knowledge-based workforce” for Europe in a singke higher education space. Fights over the Sorbonne, the seat of learning on the Paris Left Bank, usually involve students, riot police and ideology. The latest, however, is among rival chancellors and the city council. This time the stakes are for big money. 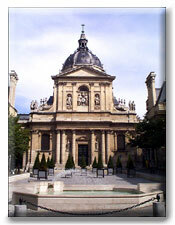 The dispute is over the right to the name Sorbonne. At least six different universities are locked in a squabble for the brand, which in the eyes of foreigners — but not the French — has a prestige on a par with Oxford or Harvard. While US and British universities have marketed their brands, the underfunded and strike-prone universities of Paris woke up late to the value of the name they share. The trouble began when one of them, Paris IV Sorbonne, opened a branch in Abu Dhabi in 2007 and sold exclusive rights in the Middle East to the name “Paris Sorbonne”. Now everyone is following suit. About 70 versions of the Sorbonne brand have been registered by six universities, the Mayor, Bertrand Delanoë, and commercial enterprises. The feud took off last year when the universities began banding together with President Sarkozy’s encouragement to create centres of excellence. The state will spend hundreds of millions of euros on the chosen few. Mr Delanoë pointed out that the Sorbonne building belonged to the council. The university bosses and the mayor held a peace meeting last week, agreeing that all Paris universities were heirs to the name and could use variants. But the battle is not over. Perhaps naively I had assumed that there was just one Sorbonne and that there was some form of regulation in France similar to that in the UK which would prevent this kind of confusion over university titles and names. Evidently not. This sort of dilution of what should be a really prestigious brand can’t do anyone any favours. But it’s pretty difficult to see how they are going to resolve this easily. EUA (the European University Association) has said it intends to publish an annual review of world university rankings. Given the growing number of league tables and rankings, national and international, and the impact of these on “decision-making and activities in universities across Europe” EUA has, rather helpfully, decided to publish an annual review of university rankings. The aim of this new pilot project will be to provide universities with transparent information about international rankings by critically evaluating their methodologies, assessing potential biases and suggesting improvements. The review will also help universities to develop strategies to cope with rankings, as well as encouraging alternative approaches to enhance transparency. The annual review – due to appear for the first time in 2011 – will include a compendium of different international ranking initiatives with a thorough critique and analysis, and will be complemented by a series of critical articles by leading experts in the field. To disseminate this information and stimulate debate on the findings, EUA also plans to organise an annual rankings seminar for university leaders across Europe. This sounds like a timely and potentially very helpful intervention. The CHE Excellence Ranking compares a selected group of European universities for each subject. Find the most interesting places in Europe for doing your master’s or doctoral degree! For seven different subjects a group of 20 to 60 European universities were selected by their results in research and (for Political Science, Economics and Psychology) internationalisation indicators. This selected group of universities is called the “Excellence Group” of the respective subject. For this Excellence Groups, an institutional survey as well as a student survey was conducted. For outstanding results in any one indicator, a “star” was awarded. Interesting approach this. Not sure that it will take off but it is a serious effort and worth watching. Also. gratifying that the University of Nottingham appears in both the Economics and Politics lists but unfortunately they seem to have failed to notice psychology. UK students: understretched or just efficient? A new HEPI report on a survey of 15,000 students finds that they averaged 26 hours of class contact and private learning. Vice-chancellors’ group Universities UK said length of study provided no information about degree quality. The think tank’s survey found that students were offered 14.2 hours of teaching per week on average. The range was from just over 20 hours to 8.4 hours. The three subjects with the lowest hours of teaching – historical and philosophical studies, linguistics and social studies – had less than half the level of teaching of the most heavily taught subject, veterinary and agricultural science. In addition, the amount of private study ranged from 16.5 hours a week among those on architecture, building and planning courses to 9.5 hours in mass communications and documentation. The average was 12.5 hours. A separate survey, Eurostudent 2005, collates comparable data on the socio-economic background and living conditions of students throughout Europe. Those taking their first degree in Germany typically spend nearly 35 hours per week in total studying, and in Portugal it is about 40 hours per week. Oh dear. So why does it take German students so much longer, on average, to complete their degrees? Despite this, the report really is worth reading.